You might be thinking, “Why would I ever spring clean my home if I’m about to move?” But having a sparkling, squeaky-clean space is key to providing homebuyers with as much value as possible! 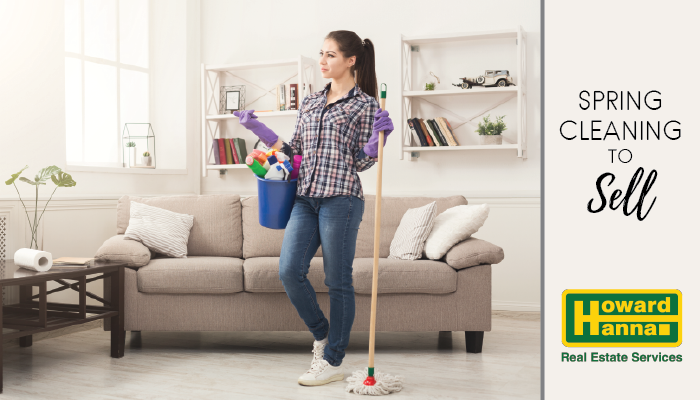 If you’re putting your home on the market this spring, make sure you take the time to tackle these critical spring cleaning tasks for home sellers. There are some chores that you may never think to do when you live in a home. After all, removing heating registers to clean underneath them is the type of task that most people are happy to forget about entirely. When you’re selling your home, however, you want to do whatever it takes to make it seem as new (and as valuable!) as possible. So, take care of the little things! Here are a few ideas, though you’ll know best what your home needs. Remove heating vents and clean behind and around them. Carefully scrub lightswitch plates and outlet covers. Clean around doors, paying attention to areas like doorknobs, frames, and sliding door tracks. Dust light fixtures and ceiling fans. Scrub grout and caulking in your bathroom. Clean the insides of your oven, refrigerator, and medicine cabinets – buyers will look everywhere! One thing you absolutely must spring clean if you’re planning on selling your home is the windows! Make sure you’ve scrubbed each pane inside and out, and removed grimy water with a squeegee. Remove and launder any draperies or hangings, and dust the blinds – an old sock over your hand works well. Scrub any sills or trim inside and out. When your windows sparkle, they’ll let in that gorgeous spring sunlight and help brighten up your home! They say that you never get a second chance to make a first impression, and that’s doubly true when it comes to your home. In addition to any exterior spring cleaning you may be doing to build up your curb appeal, you should also pay attention to the entryway of your home. Clean the floors in your entryway, then keep them clean by installing a fresh welcome mat to ensure that outdoor dust is removed from shoes. Scrub down the door, and consider repainting if it’s faded. Pay attention to cleaning the trim, and make sure any sidelights or glass inserts in your entry are sparkling. If you have a coat rack, landing strip, or any other furniture, make sure it’s decluttered and has space for visitors to hang up coats or umbrellas during home showings and open houses. While we talk about decluttering quite often in our articles on staging your home to sell it, that’s because it’s well worth repeating! We like the mantra “half the stuff” – for every cabinet and closet in your home, try to remove half of the items. Donate, toss, or simply pack away the items you won’t need regularly. Make sure items you’re keeping are stacked or stored attractively – things like hanging clothing by color make closets look appealing, even if you’d never keep it up day-to-day. Simple home staging upgrades like replacing your hampers with a more attractive option can keep areas clean while your home is on the market. Spring cleaning season is the perfect time to get your home ready to sell. Since moviation to clean is back in abundance, take advantage of the season by following these tips. Then, call your local Howard Hanna real estate agent to learn more about the process of selling your home.